The RISD (Rhode Island School of Design) New York Alumni chapter had a gathering and contest last night. 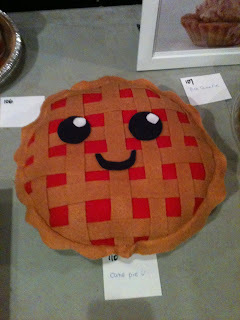 The contest was to create a pie (either edible or artistic) for various prizes. There were three categories : best presentation, best interpretation of a pie, and most unusual pie. My "Cutie Pie" won honorable mention. It was a lot of fun to get together and meet some other RISD alums as well as participate in an art contest. I enjoyed making my pie plushie and am considering making other plushies to sell in an Etsy store. It is made of recycled felt (from plastic bottles) and has a 100% polyester fill. By pie entry in the contest. A photo of me and the other winners (with our pies!) will be in the next RISD alumni magazine, RISD XYZ.